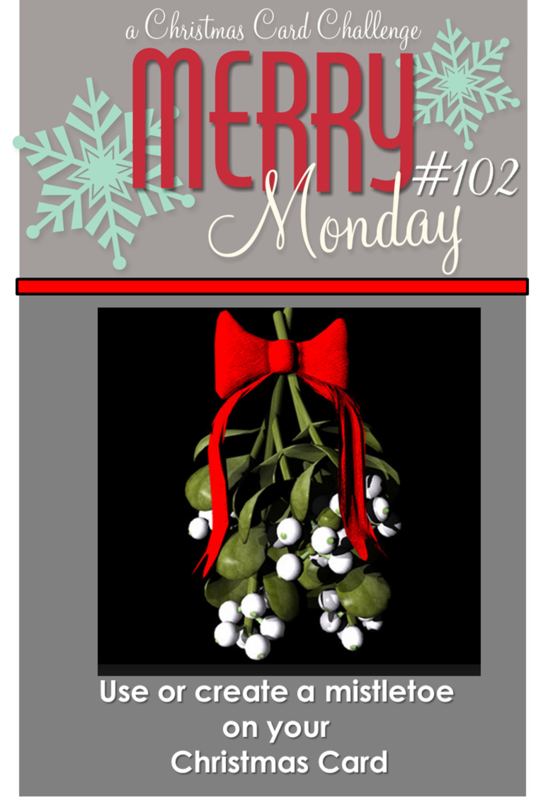 It is time for a new Merry Monday Christmas Card Challenge, this week's challenge is to Use or Create a mistletoe on your Christmas Card. I have been wanting to try this technique for awhile now, I printed this fabulous image three times then used circle die cuts for two of them and made each one a little smaller and popped them up with foam tape. 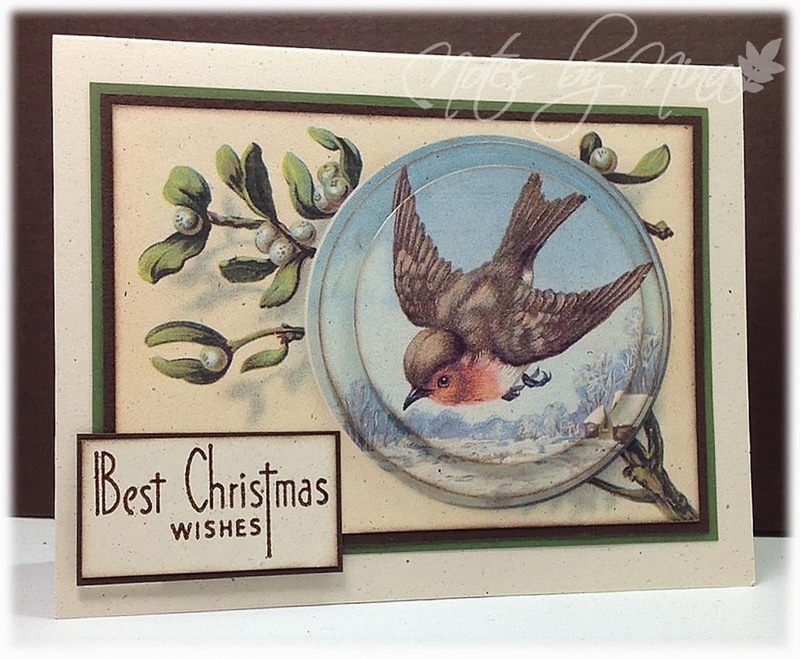 I layered the main image with green and brown card stock then finished with a sentiment. Supplies: Natural Ivory, green and brown card stock, Vintage Image - The Graphics Fairy, Cornish Heritage Farms - Vintage Christmas Expressions, circle die cut. 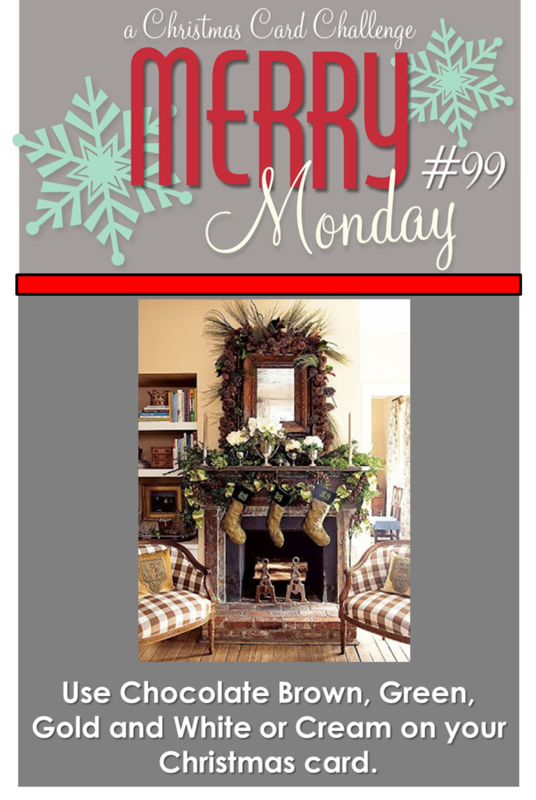 Stop by the Merry Monday Christmas Card Challenge blog to see all the great samples from the design team and to play along with us. Crafty in the morning and in the afternoon, crafty in the evening.. Actually I think that is the Skidamarink song but it popped into my head when I started my blog post.. too much tea perhaps. 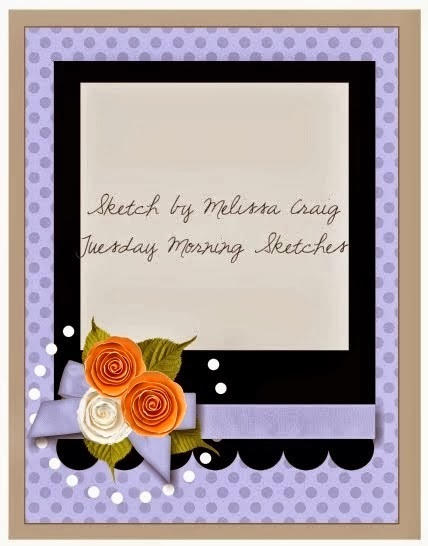 Anyhoo :), I made a card this morning for the current Tuesday Morning Sketches. 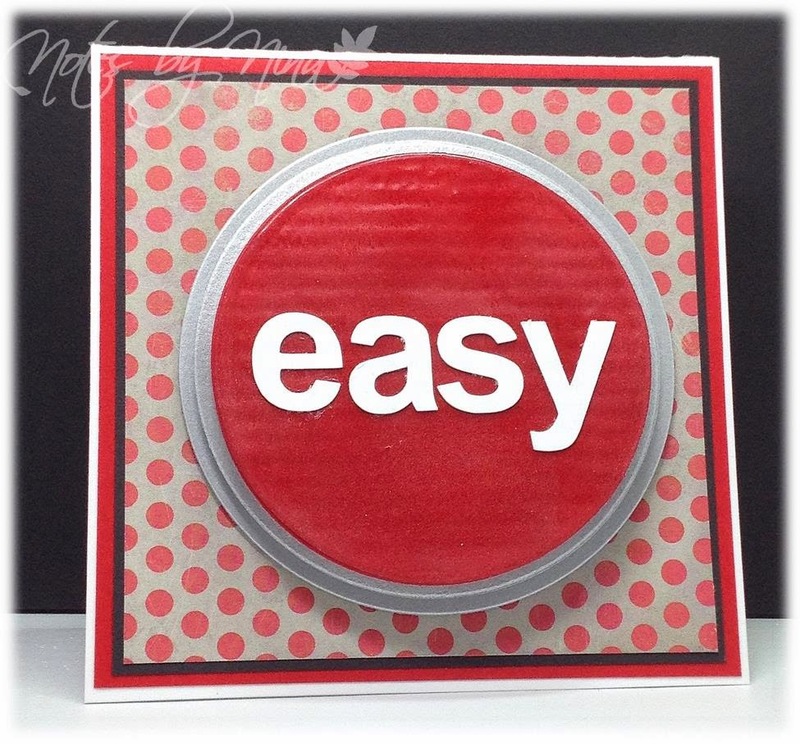 I heat embossed the sentiment on the center panel and popped it up with foam tape along with a die cut balloon. I finished with some twine and gems. Supplies: Cream and brown card stock, Designer Paper – Crate Paper, Woodware-What a Catch, Paper Smootches-Balloons wise dies, twine, gems. Happy Friday J, I am looking forward to 2 days off over the weekend. 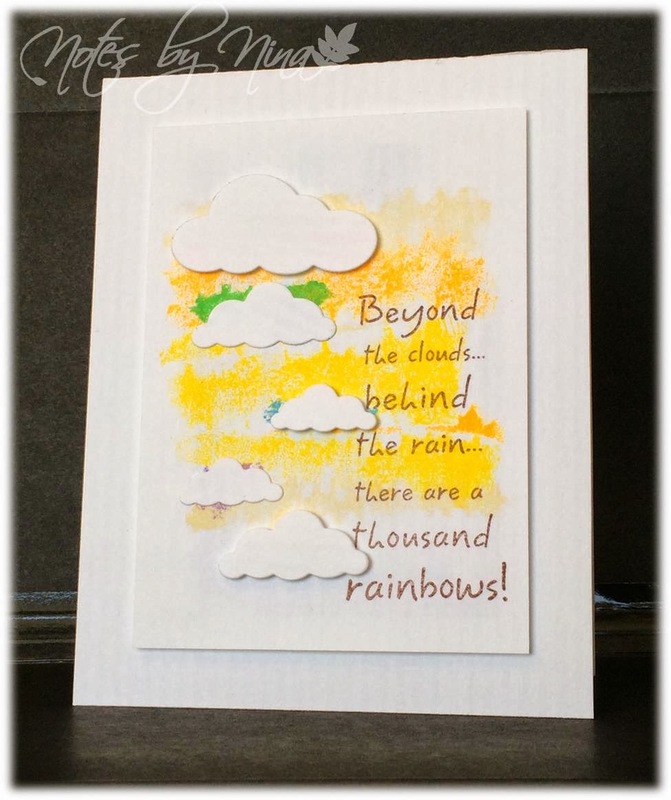 I had such fun making this card, it is actually a retirement card for a friend at work. She takes care of all the background but vital stuff, she has one of those Staples easy buttons on her desk. I don’t think I have ever visited her desk without finishing our conversation by pushing on that silly button after a number of years that is just a few ‘That was easy’s’. This card has been brewing in my head for weeks and weeks as her Retirement day gets closer and the other day I found that easy button on my desk with a sweet little note attached and I knew that my card would be perfect. 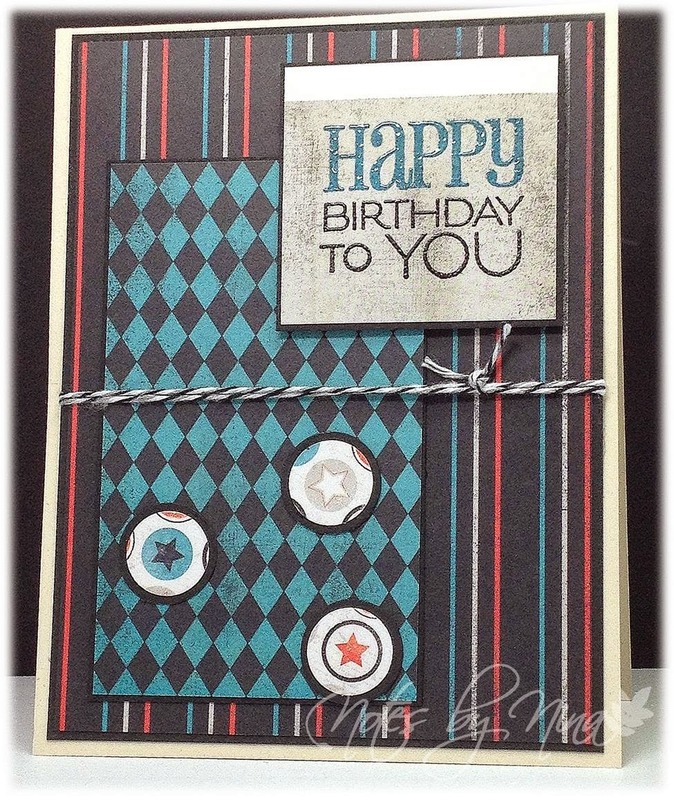 I wanted a simple or basic card so I used lots of layers, I am loving my Spellbinders circle dies right now. 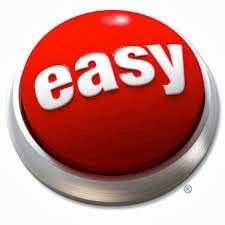 I created the layers base first then created my easy button. I used my Silhouette for the letters and heat embossed the top layer of the button with clear embossing powder. I have lots of foam tape between the layers to build up the button. 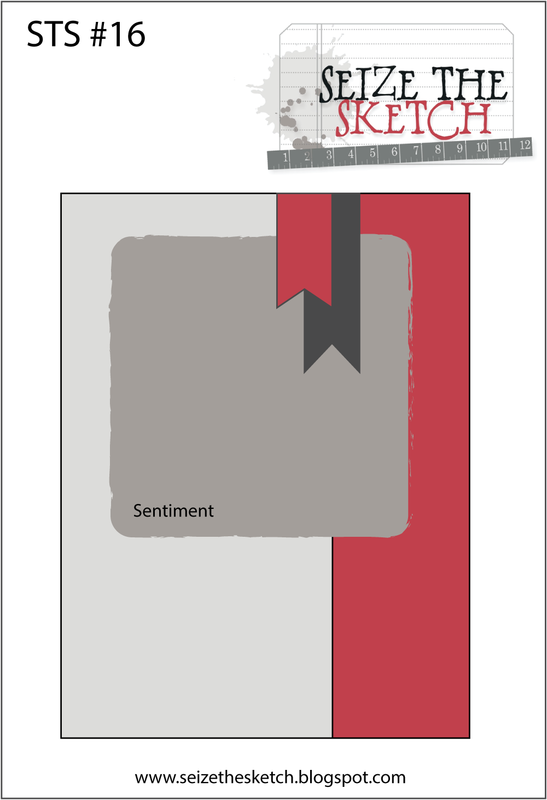 Supplies: White, black and red cardstock, Designer Paper – Crate Paper, Spellbinders. My sister Barb told me about a new to me site called Peachy Cheap, every day there is a new deal... awesome right. I think so, I don't buy the deal each day but there have been a couple I could not resist. The first was a package of like 20 rolls of twine, the second was a 4 pack of 6x6 paper pads. Anyone that follows my blog knows I am a sucker for the 6x6 paper pad. My twine arrived last week and yesterday I happily found my 6x6 paper pads in the mail so I fit in a quick card as I was running around yesterday. 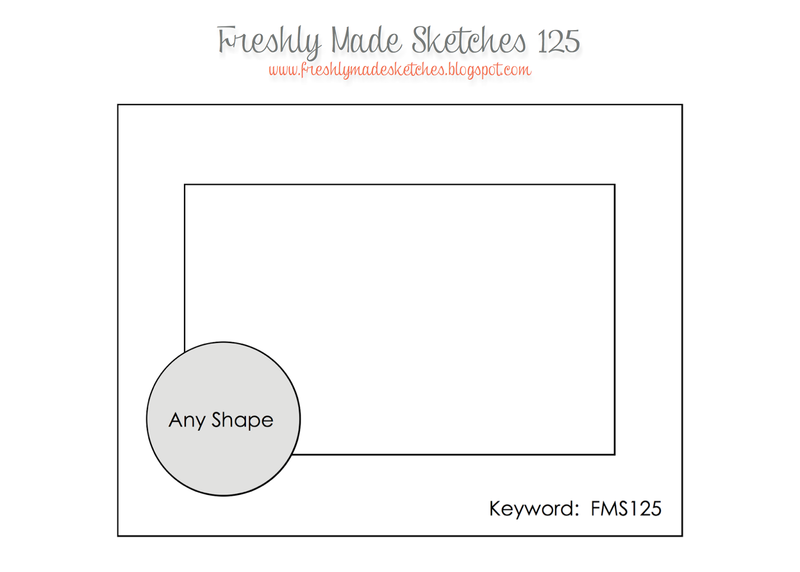 Lesley has posted a new sketch for The Challenge. I used simple layers of DP, and then fussy cut a cute jar from the paper and heat embossed the sentiment and popped both up with foam tape. I finished with a tiny twine bow. Isn't this paper darling.. love it. 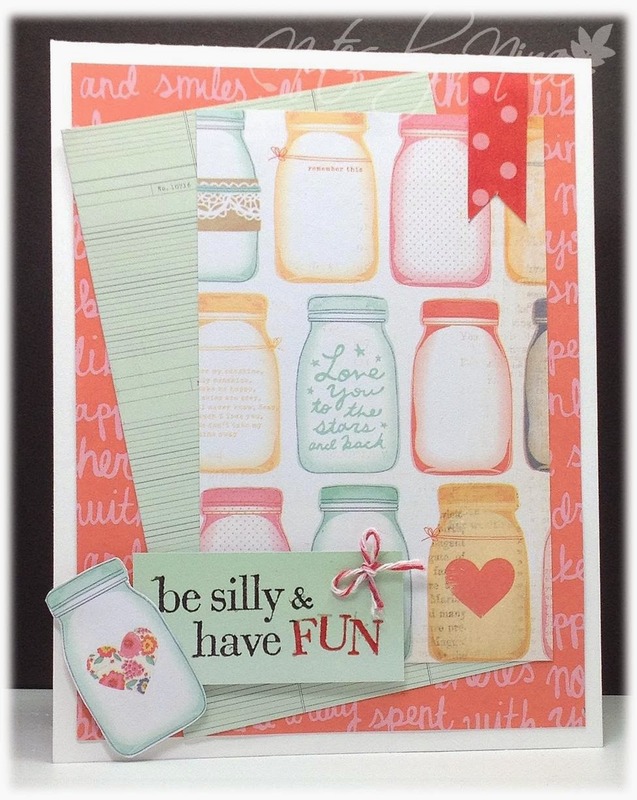 Supplies: White card stock, Designer Paper – American Crafts, Hero Arts-Be Silly, twine. 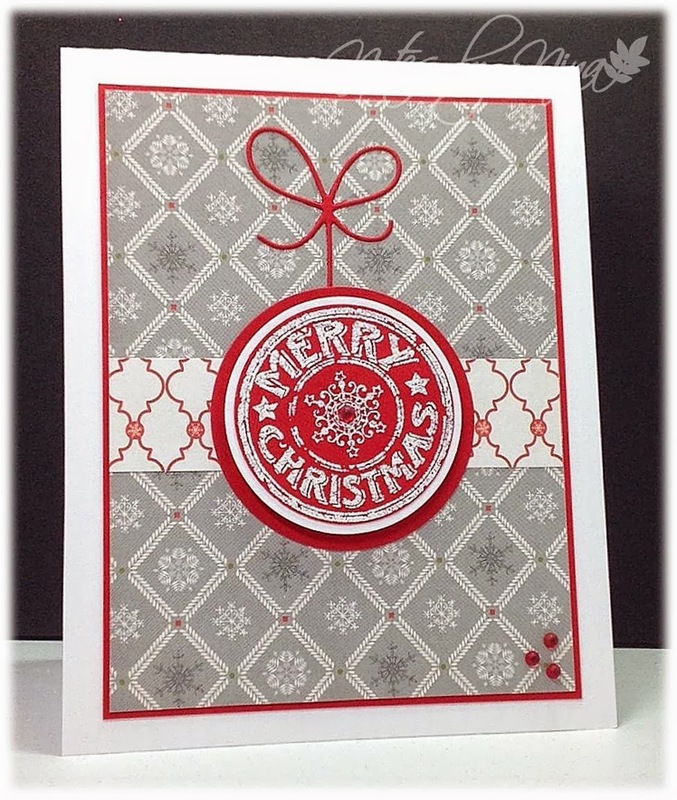 It is time for a new Merry Monday Christmas Card Challenge, this week's challenge is to Create a Christmas Card using only Grey, Red and White. I heat embossed the sentiment with white embossing power (it does have a touch of silver, but isn't silver just a glittery grey?) I used circle die cuts to create a multi layer ornament. I added a die cut bow and finished with a few red pearls. I wish the camera picked up the ornament better but I tried a few times and it was not happening. 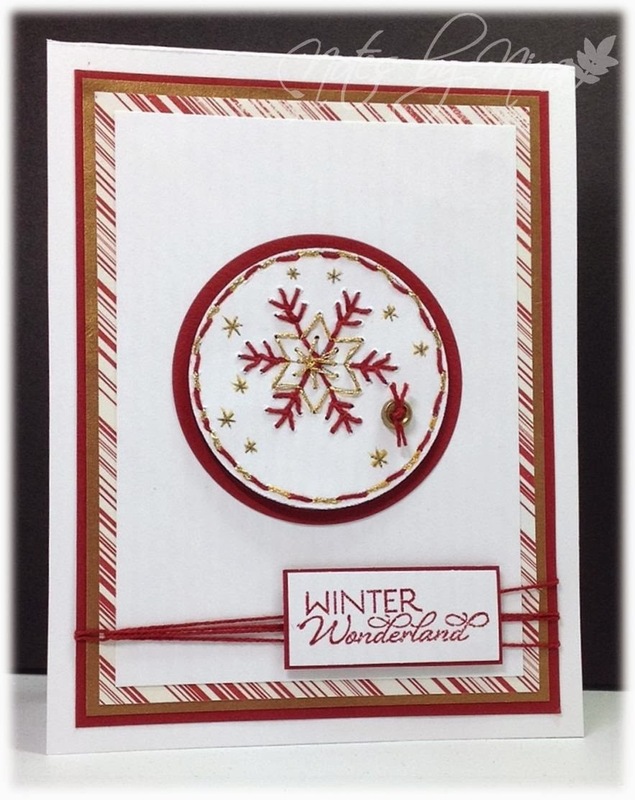 Supplies: White and red cardstock, Designer Paper – KaiserCraft, Technique Tuesday - Merry Christmas snowflake seal, die cuts, pearls. I can’t seem to sit still today; the house was cleaned by 9am as was the laundry and linens (husband helped :)). Then I decided I wanted to make some apple cinnamon scones, and then the spice cupboard got cleaned. I somehow found a box of stuff to go for donation and cleaned them up and then I put together a tray of peet pellets for garden starts. I tried to sit still for a card but ten minutes in I put some bacon in the oven for the start of some fully loaded potato soup, the rest of the prep follow closely in behind and I could understand all that if we were having the soup tonight… not. I almost finished the card before wiggle bum set in again and I went and made some cinnamon vanilla nuts, you know those nummy nuts that you find being brewed up in the corner of conventions and tradeshows. I finally finished the card which I am happy to say was intended for both the current The Card Concept and Seize the Sketch. I have a few brand new 6X6 paper pads sitting on my desk and I love these cheery colours, I heat embossed the sentiment and popped it up with foam tape. I added in a little twine and finished with the flags. 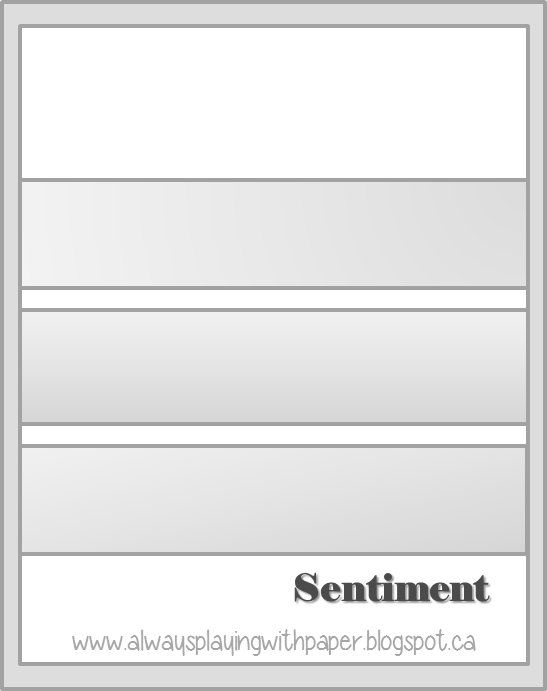 For The Card Concept I think I fall under Clean and Layered style. 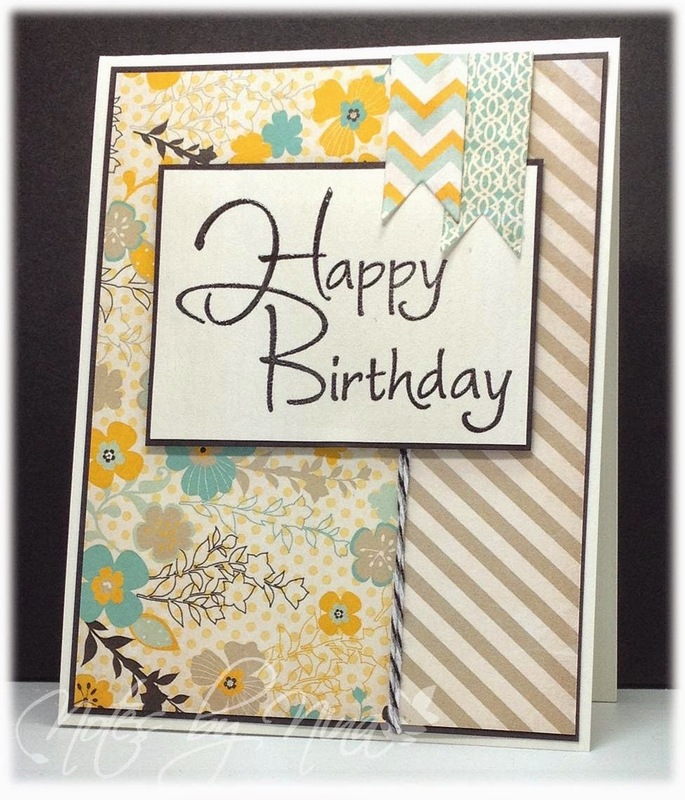 Supplies: Cream and black card stock, Designer Paper – Fancy Pants, DRS Designs – Happy Birthday, twine. I wonder what other trouble I can get into today J, I still have a couple of hrs and I still have ants in my pants so I will come back later to catch up on commenting. Spring may be here but it has still been chilly here over night and mother nature leaving a good layer of frost but the cherry blossoms, daffodils and crocuses are making a good show and it will be time to plant some seeds soon enough. My sister Barb has decided to toss her crafty towel in the Family Challenge ring hot on the heels of last week’s round. We are playing with embossing folder this time. I had my little chickie fussy cut out but I was not sure what I was going to do with him. 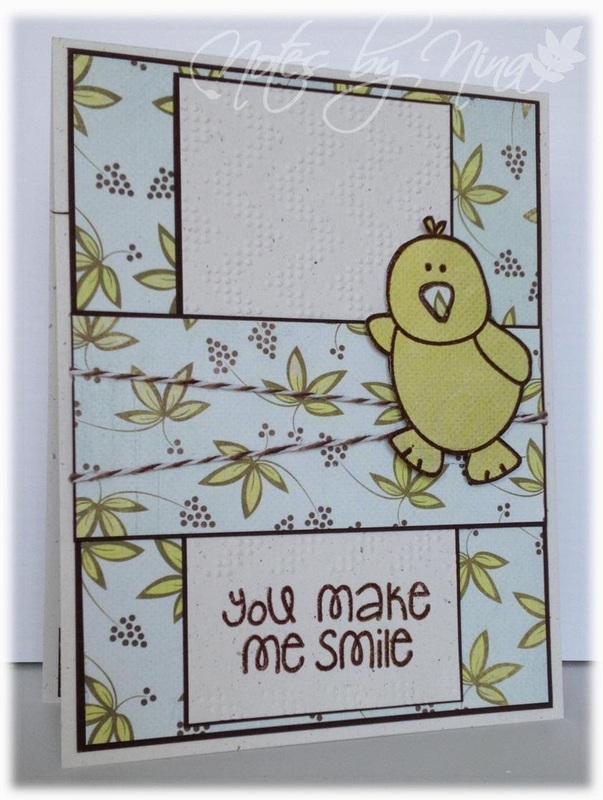 I used and embossing folder to add the funky texture to the upper portion of white panel, then I heat embossed the sentiment, and then added the same embossing along the bottom but with the texture reversed. I added the center panel with some twine then finally the little mr all popped up with foam tape. Stop by Barb’s and Judy’s blogs to see what they have come up with. I did the main panel then a second pattered layers and the third layer is the popped up sentiment which is heat embossed. I finished with circle elements and some twin. 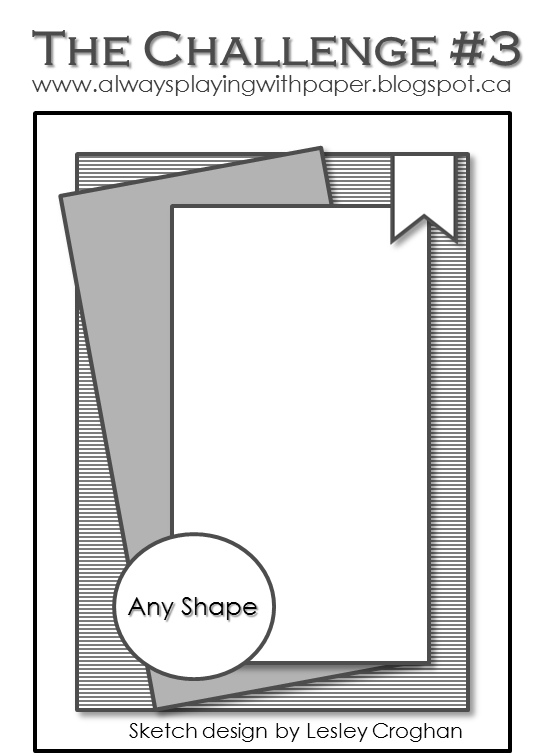 Supplies White and black cardstock, Designer Paper - , Verve – Happy Birthday, Twine. I really like how this card turned out, is was created for a retirement. 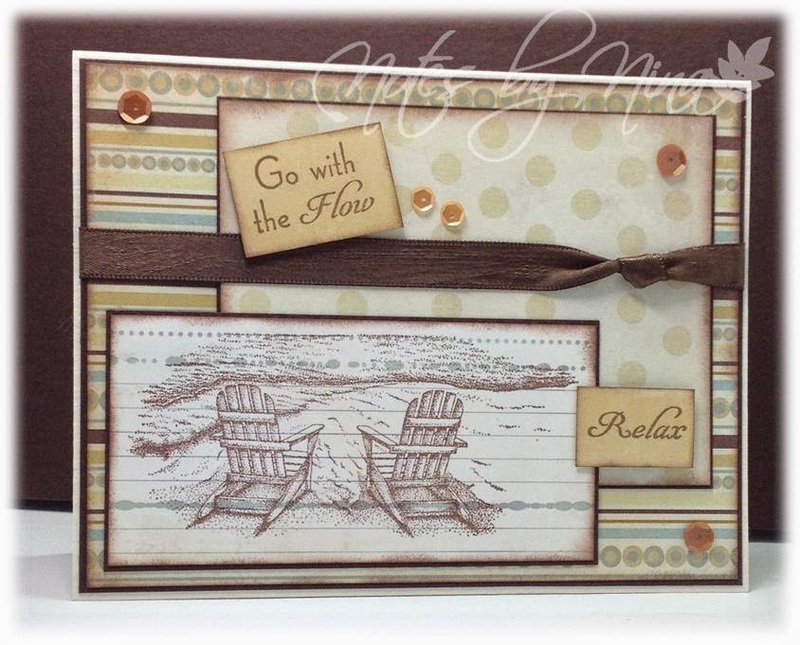 I used lots of layers for this card, I stamped the chairs on DP, then added popped up layers for the sentiments. I roughed up the satin ribbon a little and used a knot instead of a bow. I finished with some sequins. Supplies Cream and brown card stock, Designer Paper - My Mind's Eye My Favorite Things – Inspired by the Beach , sequins and ribbon. I have a quick CAS card this morning. I stamped the main image then popped it up with foam tape. 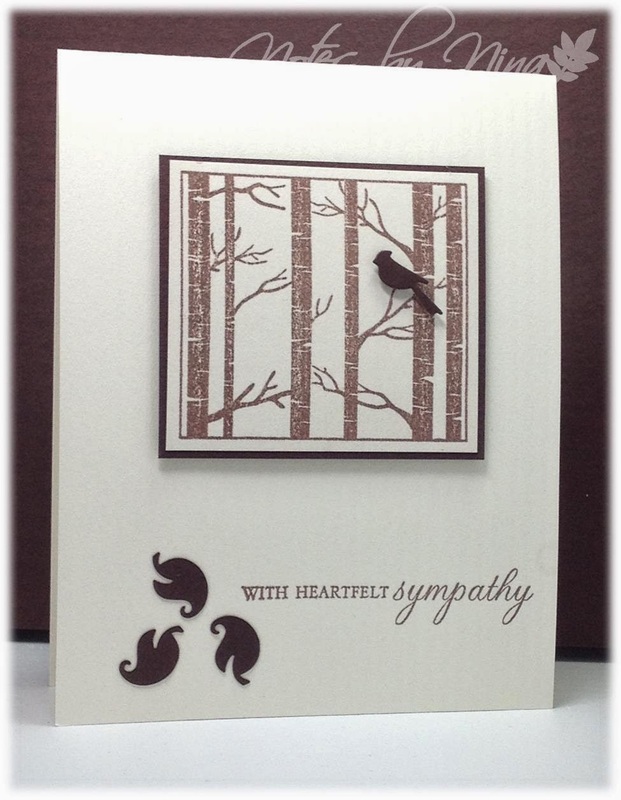 I added a sentiment and the leaves; I finished with a little die cut bird. Supplies: Cream and brown Card Stock, Papertrey Ink- Through the Trees, punches. I am so excited I received a parcel in the mail from Simon Says Stamps today, I have some new 6x6 paper pads to play with. So I decided to play along with the current Tuesday Morning Sketches. I don’t send out many Easter card but they are so fun to make. This bunny is popped up with foam tape and I fussy cut some of his parts. I used a die cut for the sentiment and shapes. I finished with some clear sequins with a tint of pink. 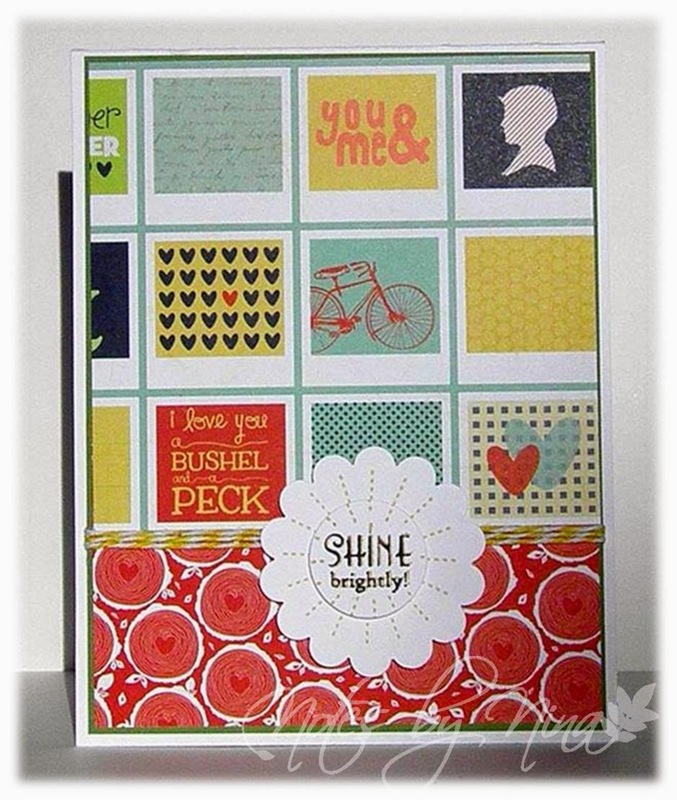 Supplies: Cream and brown card stock, Designer Paper-Graphic 45, The Alley Way Stamps – Spring has Sprung, Paper Smooches die cut, Spellbinders die cut, sequins. I will admit to rushing the ladies in my Family, I know there was a very small stretch between now and the last Family Challenge but I found saw this technique and sent it out anyway. I am happy with the CAS card that I created. I started with embossing this pretty flower with white embossing powder, then used my Stampin’ up Classic White stamp pad for the white wash look. I added a smidge of colour to the flower and leaves then stamped the sentiment in black. I added a little twine and the cute little flower that is popped up with foam tape. 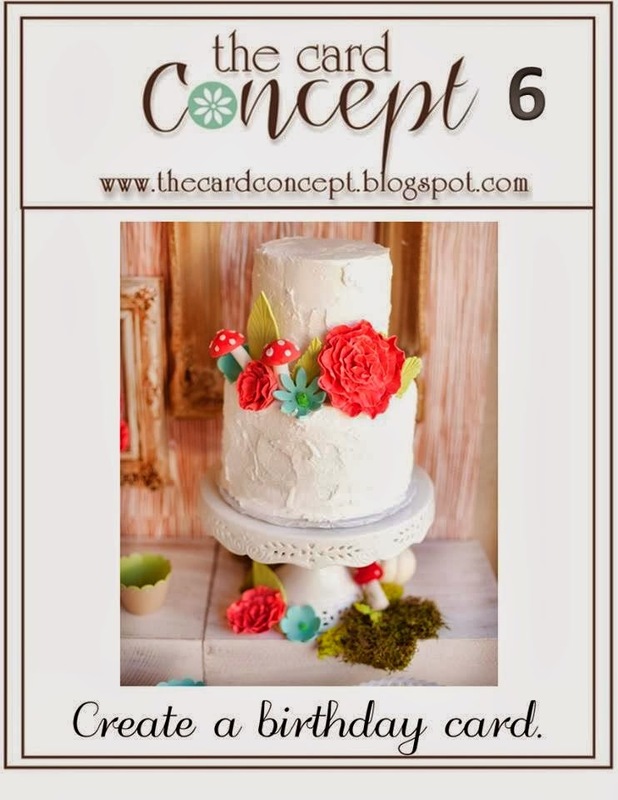 Take a look at Barb and Judy’s blogs to see what they have created with this same technique. Supplies Cream, black and green/blue card stock, Technique Tuesday - Anemone - Greenhouse Society , twine. 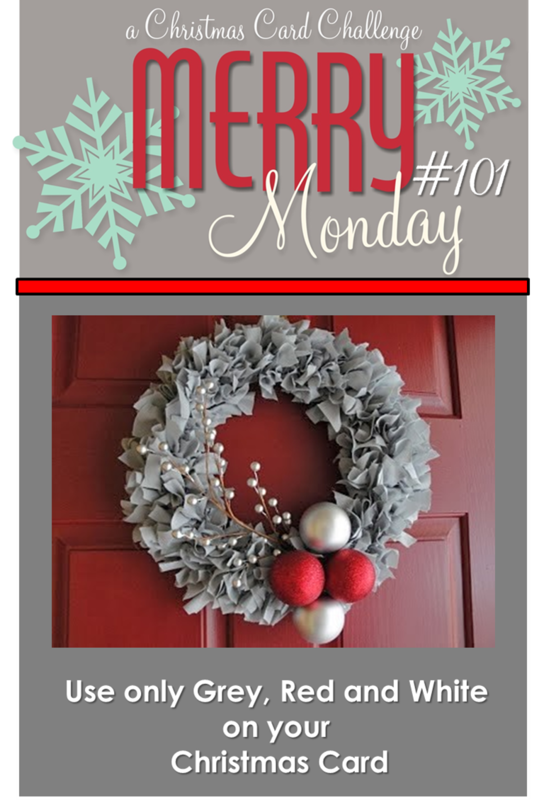 Merry Monday is celebrating our 100th Challenge, how exciting is that. In honour of this event we have a Sketch and a colour challenge. I have to admit I struggled with this challenge, I don’t work with pink much and I don’t have a green cardstock that could be labeled as lime. I however have some Designer Paper that has both colours in it, I found some cardstock that is as close to lime as I could get although it looks a little darker in the photo. I did start out following the sketch to a T, but I was not happy with the results so altered it just a smidge. 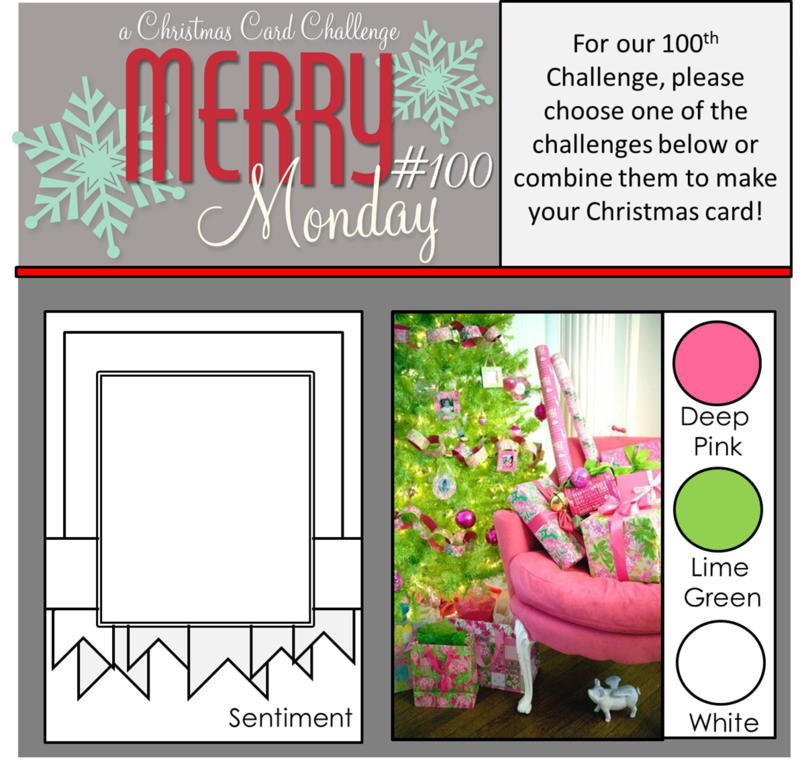 Stop by the Merry Monday Christmas Card Challenge blog to see all what the Design Team has created for our 100th challenge. Come play along with us. Supplies: Cream and green card stock, Designer Paper-Basic Grey, Verve-Poinsettia Christmas, twine. Another quick post today, I am pretty happy with this fun card. 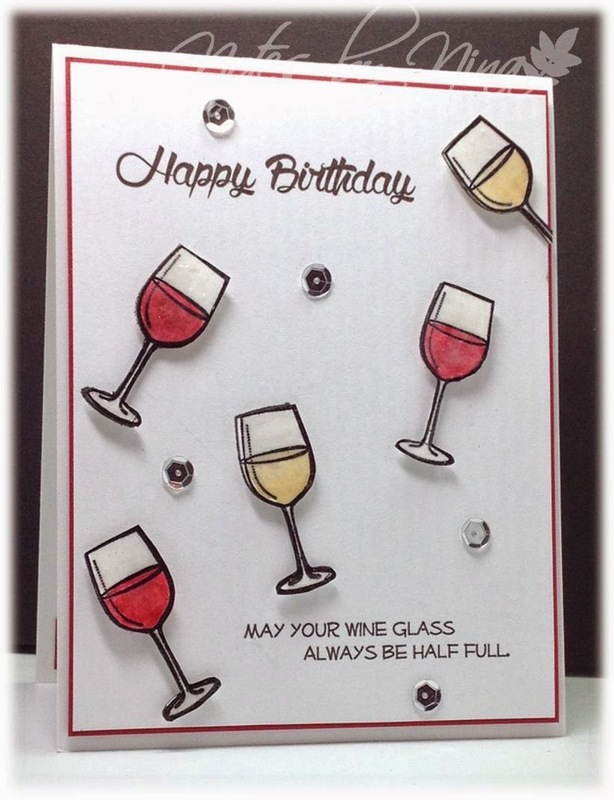 I stamped these wine glasses on the a while card stock layer then did a second batch that was heat embossed. I coloured them with watercolour pencils then added some Glossy Accents, all the glasses are double layered and popped up with foam tape.. The sentiments were printed off from Word. 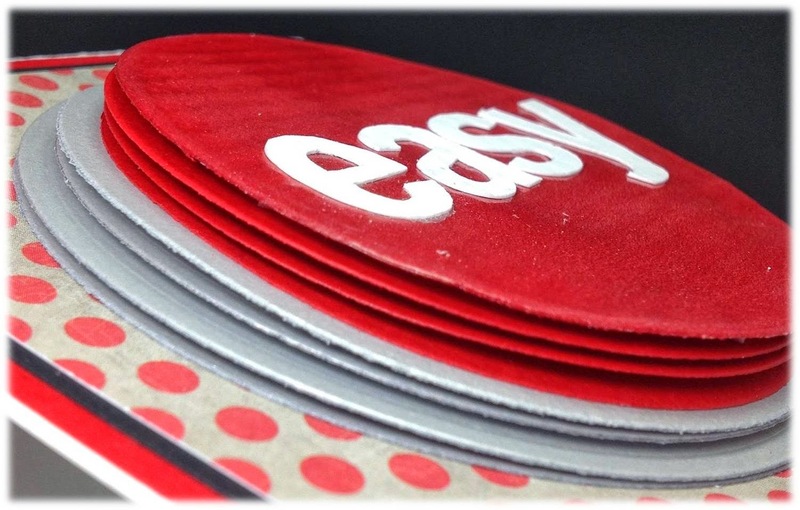 Supplies: White and red card stock, Fiskars – Aged to Perfection, sequins, Glossy Accents. Whew, I had lots of time to craft today and I have made a few cards but I am only going to share a quick post this evening. I used simple layers, added in a section made from a MFT die cut and added some twine and a sentiment. 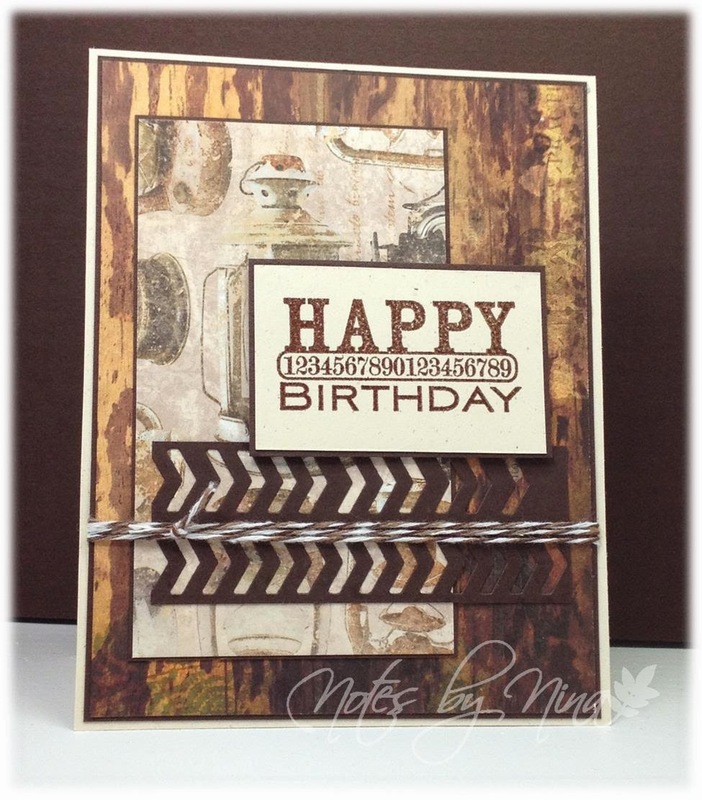 Supplies: Natural Ivory and brown cardstock, Designer Paper – Bo Bunny, MFT – die cut and HB Stamp, twine. Isn’t this card fun, I love these papers. 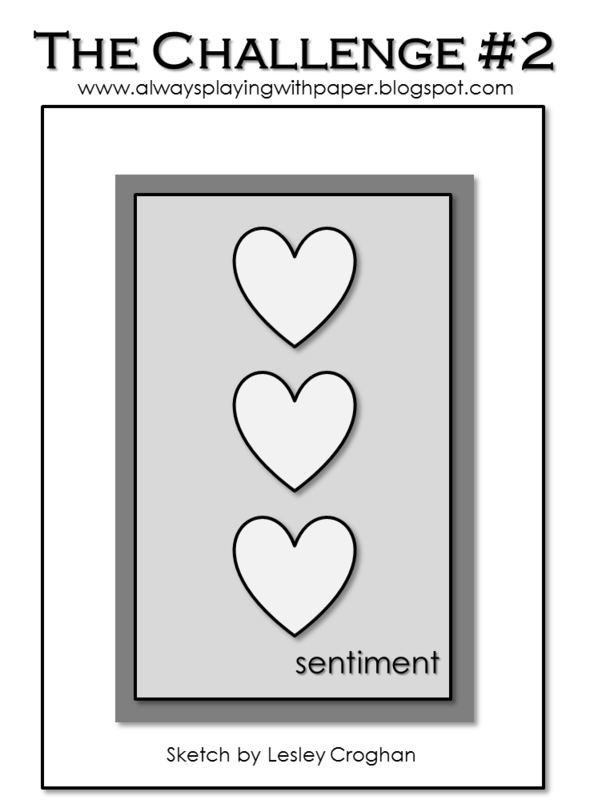 I am not sure which little square I like the most but I think it the one that says I love you a bushel and a peck. 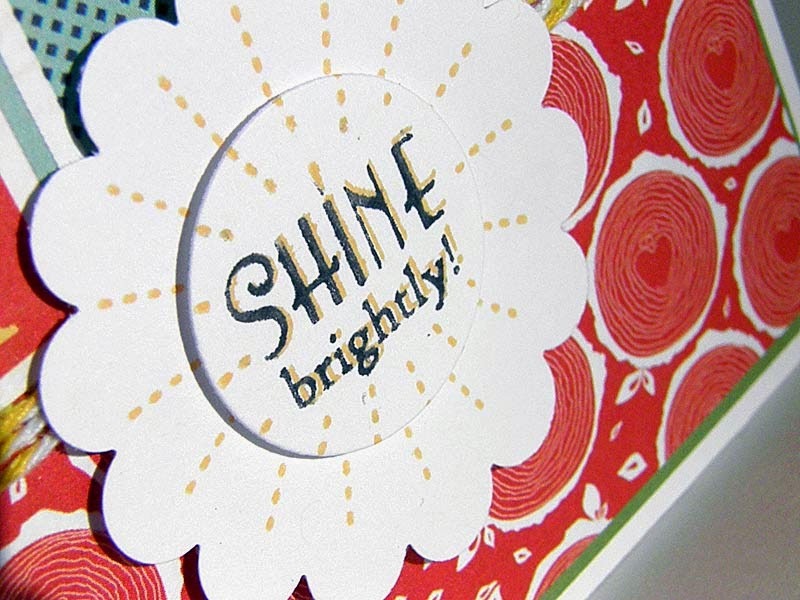 I wanted to use bright sunny coloured that would match the sentiment and create a cheery greeting. I added some twine to break up the layers then finished with a simple sentiment that is popped up with foam tape. Supplies: Cream and green cardstock, Designer Paper - Pebbles, MFT -JDL On the Line , punches, twine. 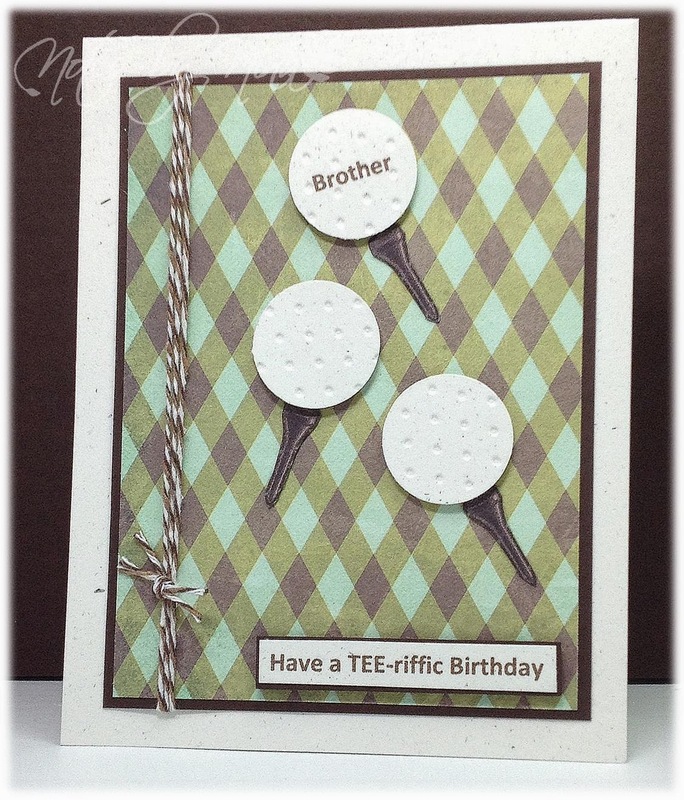 Lesley had posted The Challenge #2, I altered the sketch just a tad to accommodate my golf tee's. I printed the tee's and sentiments from Microsoft Word, I used a circle punch for the golf balls and added some texture with an embossing folder and finished with some foam tape to pop them up. Supplies: Natural white and brown card stock, Designer Paper-Fancy Pants, circle punch, clipart - golf tee, embossing folder. A quick post for the current Tuesday MorningSketches, I was trying for a feminine card. The twist, 3 B's, I have Butterfly, Brown and Birthday :). I stayed with simple layers, I added some lace along the bottom. I used a punch to shape the second panel. 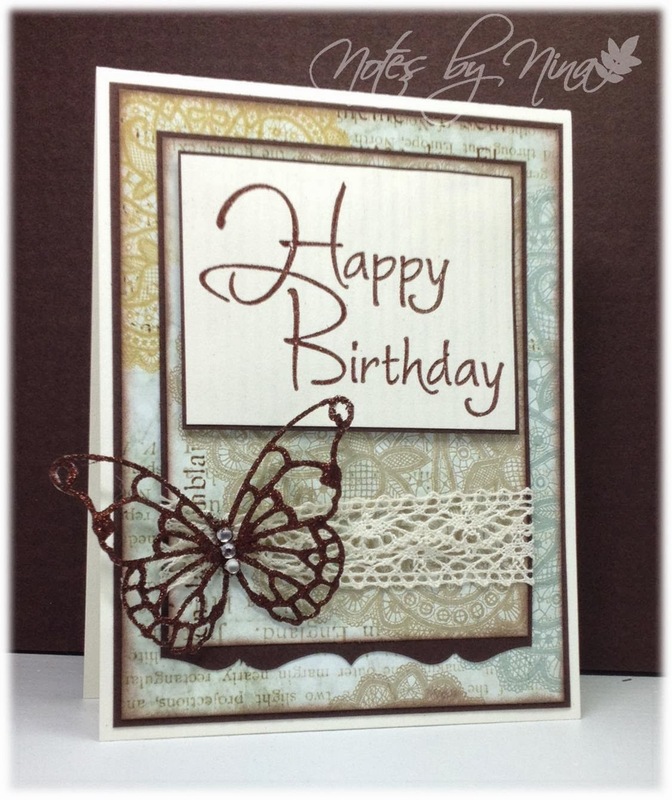 The sentiment is heat embossed, and I used Goosebumps to add some glitter to the butterfly. Supplies: Cream and brown card stock, Designer Paper-Pink Paislee, DRS Designs - Happy Birthday, Memory Box - Vivienne Butterfly, glitter, pearls, lace, punch. 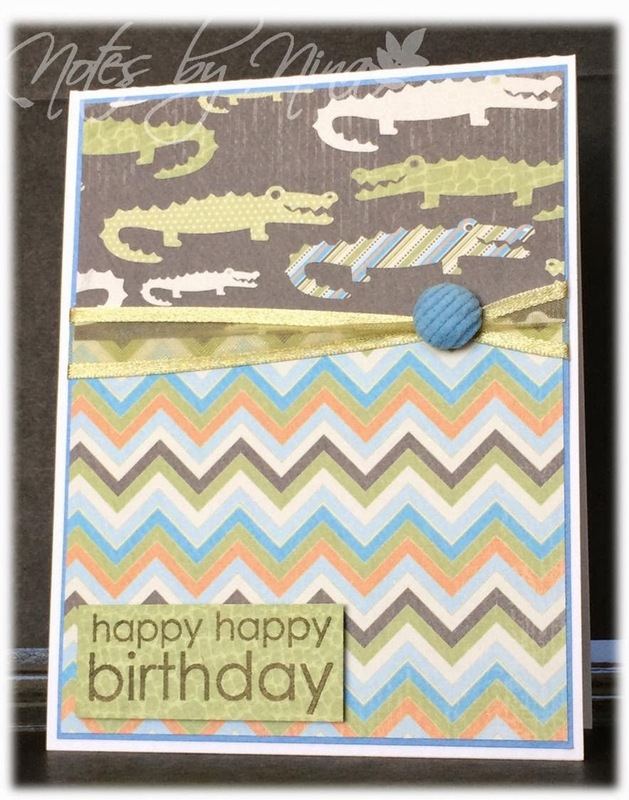 Do you ever feel the need to make a card but you don’t have person in mind or even a challenge, that was me Sunday night and I ended up with a couple of card that are pretty simple layouts. This paper was in my stash and I did not even know it, it is so cute... I am not sure I even did it justice with the CAS look. I used quick layers, the sentiment took me a few tries to line up correctly and not leave ink everywhere as I double stamped but the die cut bubble work excellent. I finished with some twine and sequins. I want to add sequins to all my cards right now.. crazy right.. I think so too. 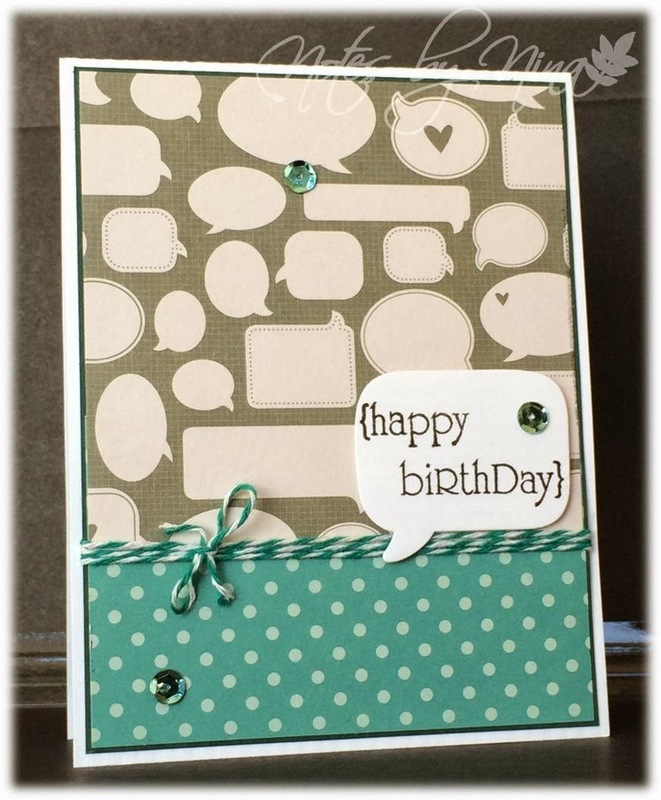 Supplies: White and turquoise card stock, Designer Paper -Pebbles , Lawn Fawn die cut, Papertrey Ink – Birthday Wishes, twine and sequins. Happy Tuesday, my card this morning is for a Family challenge. I chose the technique this time around and I have seen the painters tape technique making the rounds lately so here goes. It actually took me two tries before I was happy with the result and even then I don’t think this is a technique that will be repeated on a regular basis. I will admit to not using glossy paper, or ummm water-based ink truth be told. This is the first card I made, I feel I added to many colours.... I started with the array of yellows which I liked, then though I would add in some more ‘rainbow’ colours. I was not happy with it after that. So I decided to try a second time. This one I used blues which I like just fine, I added in some off set clouds and finished with a few sequins. 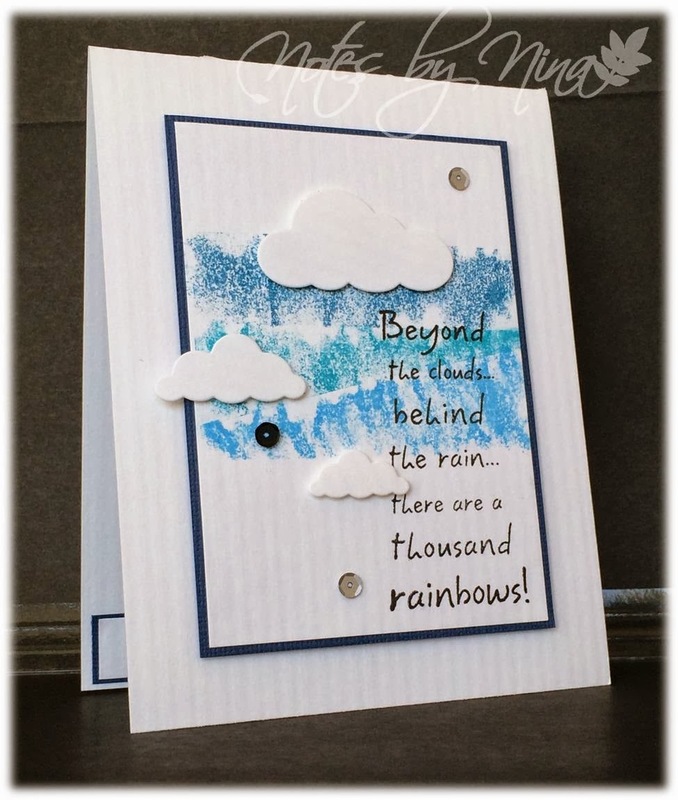 Supplies: White and blue cardstock, Woodware – Beyond the Clouds, Memory Box die cut, sequins. Take a peek at Barb and Judy’s blogs, they have played along with me. I was in the hunt for a specific item this weekend and in my crafty travels I found a little package that contained cardstock, DP, brads and ribbon. I picked it up at one of those craft garage sale type events ages ago and I have no clue who made them. Anyway, I don’t use or make many cards for kids but when I pulled this out I felt like putting together a simple layout. I used basic layers then added some matching shear ribbon and a fuzzy brad, I finished with a sentiment that is popped up with foam tape. Ignore the questionable photo I was trying out the new IPhone 5S at work but the lighting is horrid but I am also not concerned enough to retake them when I get home. 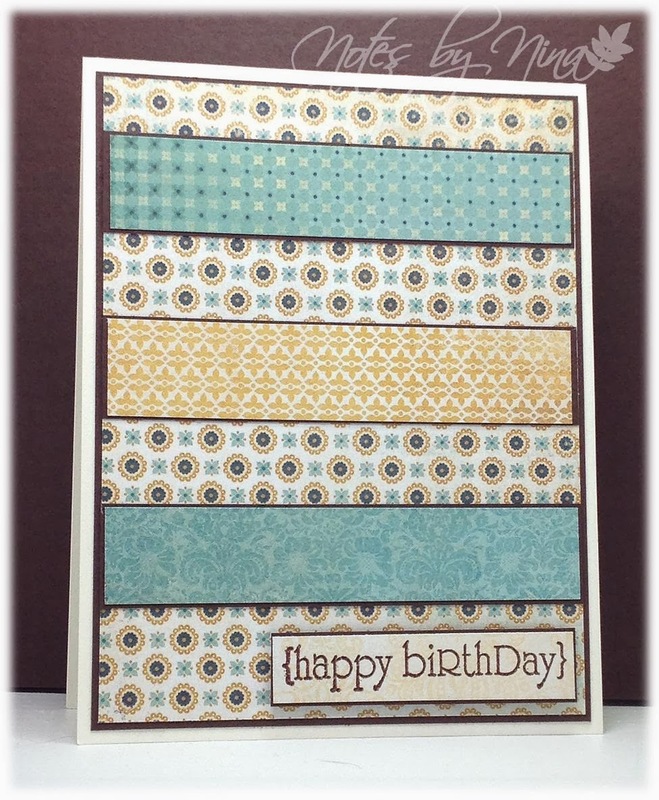 Supplies: White and blue cardstock, DP – Unknown, Papertrey Ink – Birthday Wishes, misc ribbon and brad. It is Monday and that means we have a new Merry Monday Christmas Card Challenge for you, this week we would like you to Use Chocolate Brown, Green, Gold and White or Cream on your Christmas Card. would not pick it up. I added a little bit of cream ribbon with gold trim and finished with some brown pearls. 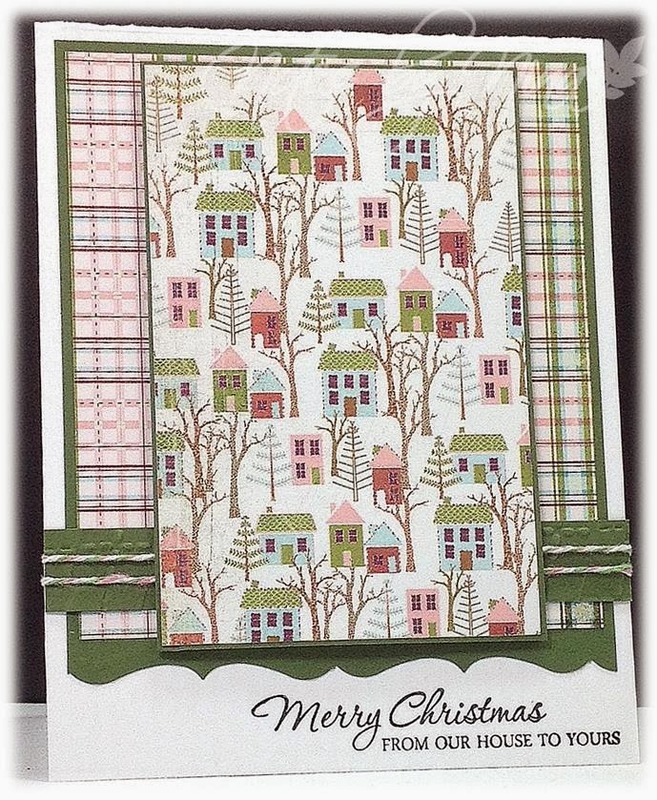 Stop by the Merry Monday Christmas Card Challenge blog to see all the wonderful creations by my fellow Merry Makes and we would love for you to play along. Supplies: Cream and brown card stock, Designer Paper-Kaiser Craft, Christmas Calligraphy, ribbon and pearls. Seriously I am in awe of Lesley, I have no clue where she finds the time to do all the things she does, I love all the challenges she has created and she is always a great inspiration for me when crafting. 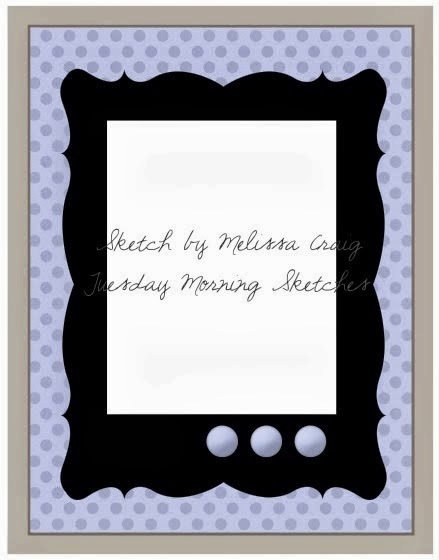 This sketch is currently posted on Lesley’s Blog, Always Playing with Paper and the challenge is running for two weeks. I still had this paper pad out so I decided to see what I could come up with. I stuck pretty close to the sketch and just used layers, the sentiment is popped up with foam tape. 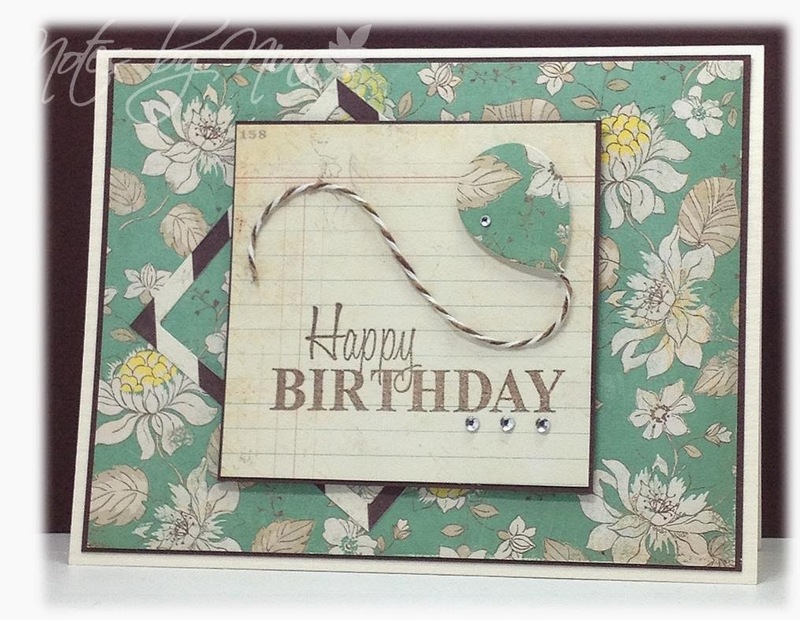 Supplies: Cream and brown card stock, Designer Paper-Stella Rose, Papertrey Ink – Birthday Wishes. 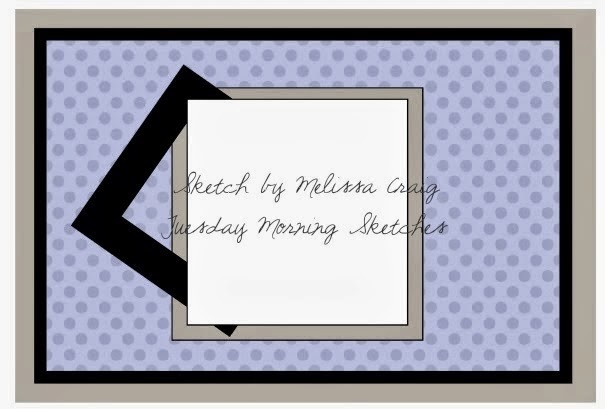 A short second post for today, this one is for the current Tuesday Morning Sketches challenge. I seem to be having all sorts of formatting issues with blogger lately. I pulled out one of my older 6 x 6 paper pads for this card, I tend forget them when I play with newer products. I heat embossed the sentiments, and popped the main one up with foam tape. I used twine for the top to bottom elements, I like the CAS look of this sketch. 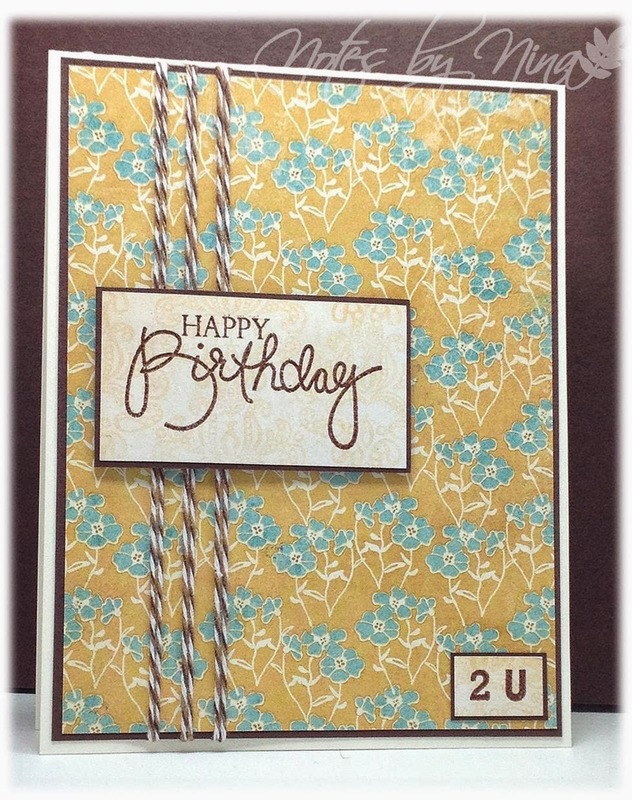 Supplies: Cream and brown card stock, Designer Paper-Stella Rose, Papertrey Ink-Birthday Bash, twine. Colleen from One Smile lifts A Spirit had nominated me for a Liebster award, Thank you Colleen, I am honoured. 1. Be sure to thank the blog that nominated you and be sure to link back to their blog. 2. Answer the 11 questions that the blogger asked you. 3. Nominate 11 of your favorite blogs with under 500 followers and ask your own 11 questions. 4. 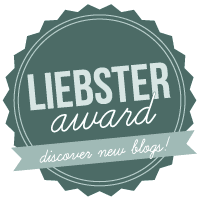 Make sure to let each blogger know about your Liebster Blog nomination on their blog (leave a comment and link back to your Liebster Blog post). Unfortunately the only rule I am going to gracefully bow out of is nominating 11 additional blogs, I am sure everyone can respect that choice and I thank you all for that. 1. Tell me your favorite three stamp companies. My preference for stamps can often change but right now, Papertrey Ink, The Alleyway Stamps, Verve... ugg only three. 2. Do you enter challenges? If so, what are your favorites? I love challenges, the Design Teams never fail to inspire me. 3. How long have you been making cards? I have been making cards for about 10 years. 4. What is something you cannot live without in your craft arsenal? I have way too many treasured supplies to even identify which would considered 'live without'. 6. If you could visit one place in the world (and money was NOT an issue) where would it be? I have more than one location here are two, I would love to walk on the Great Wall of China, I want to one day touch a majestic Pyramid. 7. What do you do with all the cards you make? I have a lot of extra cards, I can make them for specific events and people that is the best but all the one that are not spoken for go in a box that sits in my office at work, I have a few people that like to come in and exchange a card for a $ donation to future craft supplies. This is my second post of the day so it will be a short one. This card is for the current Freshly Made Sketches Challenge, I missed the deadline but I still wanted to play along. I used simple layers, then heat embossed both the balloon and the sentiment, I think fussy cut the balloon and popped it and the sentiment up with foam tape. 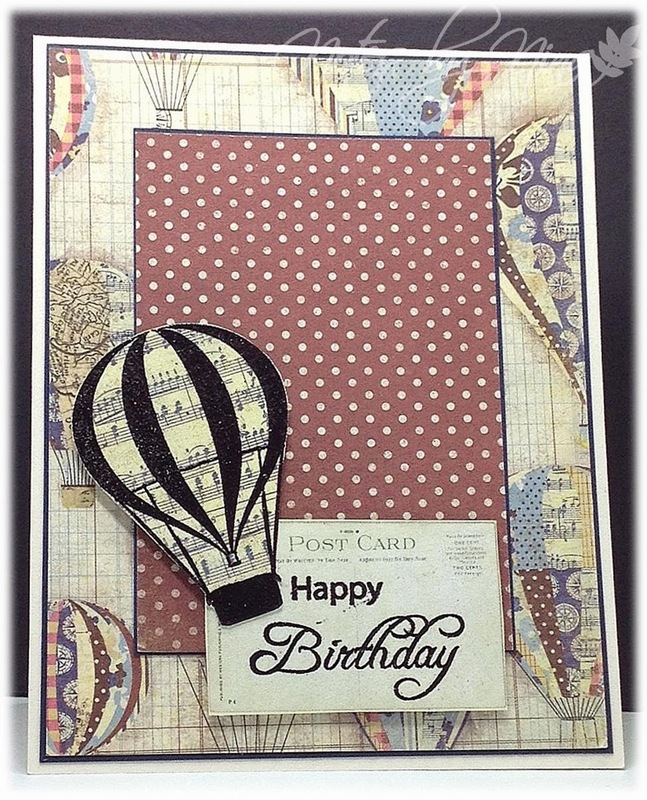 Supplies: Cream and blue card stock, Designer Paper-Farm House, Inspired by Stamping-The Sky’s the Limit. 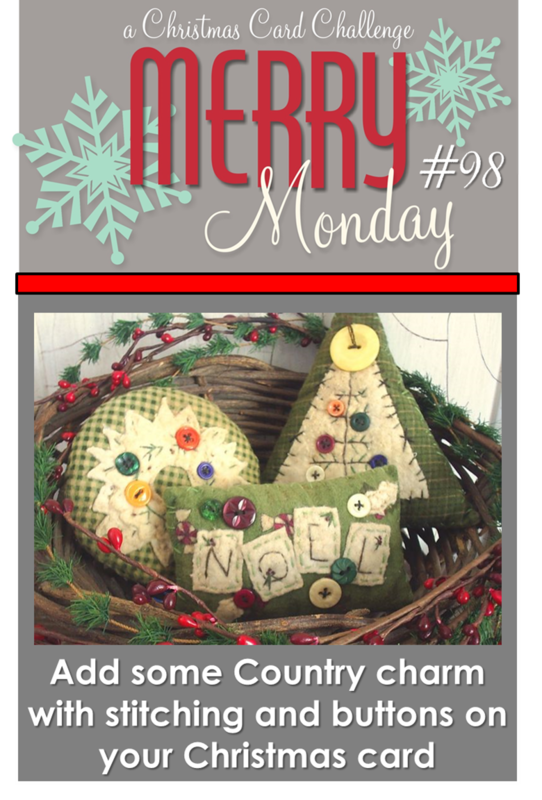 Happy Monday everyone, it is time for a new Merry Monday Christmas Challenge, this week we are asking you to Add some Country Charm with stitching and buttons on your Christmas Card. I found this stitch pattern for cards online HERE, and decided to give it a try. The needle left some holes bigger than I liked but I still like how the card turned out. I used a gold glitter pen for the stars and the little button is placed just so because at first I tried to sew those little stars too and it did not really work out, so the button is covering up a boo boo. 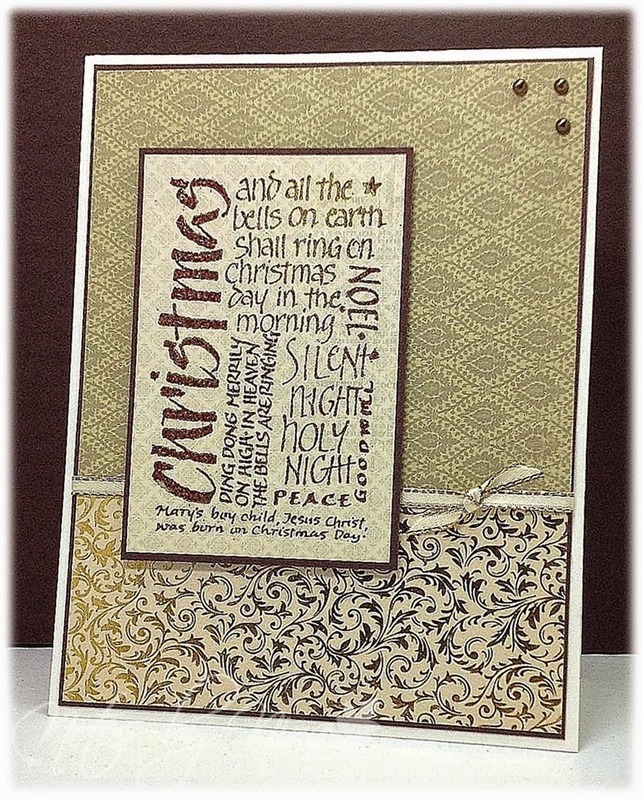 Stop by the Merry Monday Christmas Card Challenge blog to see all the great samples the design team has created and to play along with us. Supplies: White, red and gold card stock, Designer Paper – Fancy Pants, Verve - Glad Tidings, button, Gold and red twine, stitch pattern.